Upgrade your residential or commercial property with professional concrete services. Concrete is a durable and tough substance that has many uses in residential, industrial, and commercial industries. For those with families or lots of foot traffic inside the home, concrete polishing, restoration and staining serivces provides a long-lasting and durable flooring solution. Concrete is very versatile and can be polished or stained to accomplish beautiful personalized results. While many homeowners aren’t aware that concrete can add a beautiful decorative effect, concrete floors inside and outside the home have become popular home decor choices around California. Our concrete polishing, restoration, and staining services in southern California gives a whole new meaning to the expression “glossy finish.” When we’re done, every concrete surface we touch in your home, office, commercial, or industrial location will look amazing with a professionally polished finish and shine. Our urethane cement flooring solutions bolster our services offerings to all our happy clients! When it comes to concrete polishing, restoration, and staining services in southern California, our blend of dyes and timing produce the perfect color, no matter the location. Concrete floor dye is an art that requires precision of portions, sequence, and timing to achieve an artistic look within the concrete itself. Concrete staining allows for the removal of stains, leaving your concrete looking brand new. If your concrete has been chipped or cracked due to old age or accidental drops, our concrete polishing service will restore its original shine and breathe new life into your space. We are passionate about our art, and only true specialists can transform old concrete into a brand-new work of art! Our urethane cement flooring services are pefect additions to your residential and/or commercial business needs. If you would like to revitalize the concrete in your home or business, don’t hesitate to contact our concrete & floor polishers! We offer free assessments, and we’re happy to come to your home or business at your convenience. Concrete staining and sealing can restore any concrete surface, making it look entirely new, or it can be used to match your new concrete surface to your home’s décor. Our concrete staining and sealing services in southern California is appealing to many people because it’s a cost-effective decorating method that can produce an incredibly wide variety of effects. Depending on the color tones and the techniques used, stained concrete can be made to mimic almost anything! Polished marble, tanned leather, natural stone, and even stained wood effects can be achieved through our concrete services. Moreover, concrete staining can be used on any concrete surface: old, new, plain, multi-colored, indoor, or outdoor. Because concrete staining penetrates into the top layer of the concrete surface, their color will not fade, chip, or peel away. In fact, stained concrete is one of the best long-term investment you can make in your home! If you’re thinking about adding stained concrete to your home, our specialists can provide you with a no-cost assessment. Acid-based concrete stains react chemically with concrete, penetrating into the surface to form a permanent bond resulting in richer, mostly translucent earth tones. Acid-based concrete stains can produce a wide range of deep colors, including tans, browns, terra cottas, and soft blue-greens. Wide color variations are normal and will be emphasized after the sealer is applied. Water-based concrete stains non-reactively fills the porous concrete, which results in more consistent opaque or translucent colors that can reach a wider spectrum of hues. If you’re interested in staining the concrete in your home or business or seek urethane cement flooring solutions, contact our restoration company today! 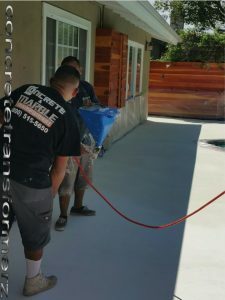 Call or email us for a free estimate, and find out why Concrete & Marble Transformerz is a Top-Rated Local® floor polisher in Southern California! Our work ethic is unparalleled and our results speak for themselves! We’ve helped hundreds of people in Long Beach, Redondo Beach, and the greater Los Angeles County rejuvenate their concrete.